Sue has been a Dental Nurse since leaving school. Working as Head Nurse in Norwich where she qualified for eight years in both NHS and HM Prison practices. After a move to Bath, sedation experience was gained in a Private Practice. Following relocation, to Lincolnshire, she worked in the local primary school whilst bringing up her four children. 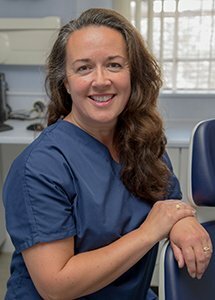 Another move to Buckinghamshire and subsequently Oxfordshire with her husband’s job allowed her to work for ten years as Senior Dental Nurse in Marlow. Finally, after moving locally she joined TDP in June 2017. Outside of work Sue enjoys spending time with her grandson and family, Zumba, bodyboarding, needlework, renovating her house and would like to take her Advanced Driving Test.